Season 2 of the Living World has begun and it has kicked off with the opening of the Gates of Maguuma. 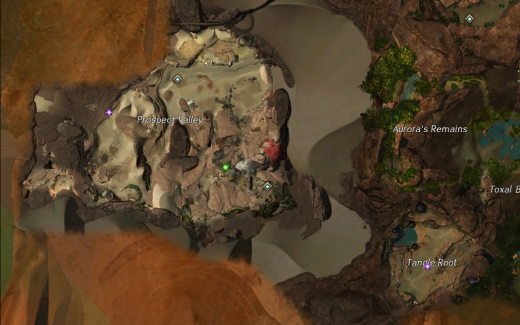 We’ve been waiting for this update for some time now; it contains the first new permanent region we have had since Southsun Cove was added in a rather technically challenged update back in November 2012. It also contains the largest amount of story content ever released in a single update yet, and in my opinion, some of the best. The new region, Dry Top (left) and Tangle Root (right), a small area added to Brisban Wildlands. 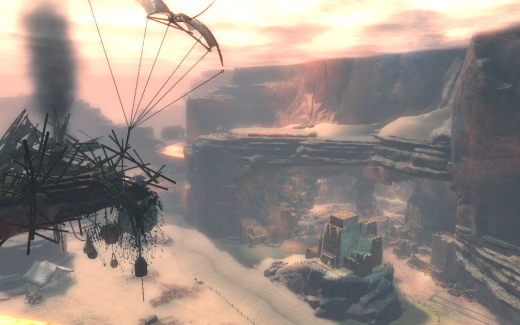 Let’s start with the new map; Dry Top is an arid region of the Maguuma Wastes. It is very craggy and has sand, lots of sand; in fact it introduces a hitherto unseen weather effect in Tyria; the sandstorm. The unique mechanic of this map is that it has two phases, the first is a phase where the players must complete events to earn favour with the Zephyrites. As favour is earned different tiers of merchants are unlocked, the higher the tier, the more items are on offer and prices are reduced. This phase lasts for 40 minutes. Events within the map award Geodes, a currency that is used with the merchants and is unique to Dry Top. 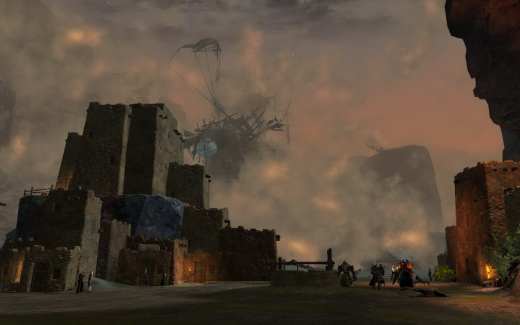 The second phase is the sandstorm, during this phase players cannot earn favour with the Zephyrites and when the sandstorm ends, favour will reset. Some events still run though and it is only during the sandstorm that players can find and open the Buried Locked Chests. These chests can only be opened with a Zephyrite Lockpick (which are purchased or earned through achievements) and they contain an assortment of items from vendor trash to ascended equipment. 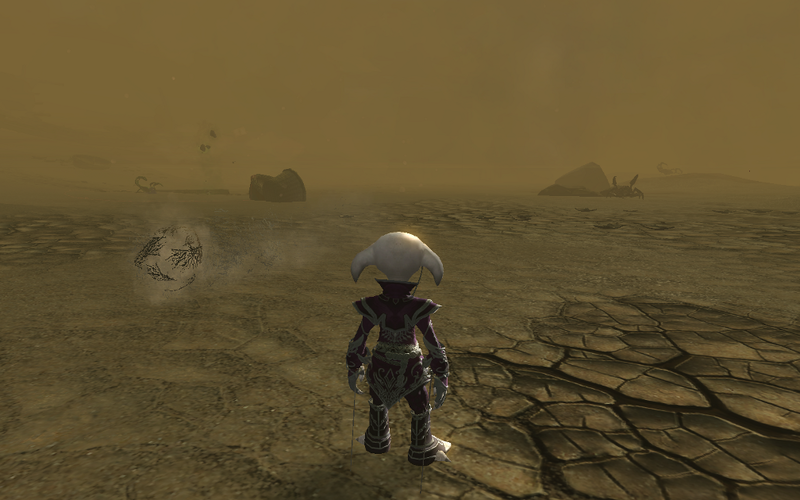 The sandstorm lasts for 20 minutes before dissipating. Inside the storm; visibility: low, chance of hostile encounter: high, bad jokes likely. The sandstorm as seen from the relative shelter or Prosperity. Spot the Luxer. But what’s a great new map without a story to go with it? This episode is quite large in comparison to previous living story releases, there is much more story content. From the beginning in Tangle Root of the Brisban Wildlands through to and around Dry Top there are four instances of decent length as well as an open world quest line tying them all together. The new method of presenting the story along with the new journal features allowing you to replay it makes it flow much better and feel less fragmented. What’s more, you are rewarded for replaying the content; after your initial playthrough you unlock a set of achievements that you can go back and attempt for rewards that are related to the release. There’s nothing particularly special about these rewards so if you’re not the kind of player who enjoys achievement hunting then you don’t need to feel like you have missed out. Prosperity, a mining town and the only settlement in Dry Top, as seen from above. It is protected by a river of quicksand, be careful when trying to cross. I have really enjoyed this release, when I started the story I just couldn’t stop and now I eagerly await the next update on July 15th. I hope you are enjoying it too. Yes, finally starting to get some real background to the whole of LS1 is really good (better late than never :p). Great area too, you can see tech they experimented with in EotM creeping into these new updates.